As loyal listeners know, Lynne and Sally share an unrelenting curiosity about everything to do with food. Their show, The Splendid Table, looks at the role food plays in our lives—inspiring us, making us laugh, nourishing us, and opening us up to the world around us. Now they have compiled all the most trenchant tips, never-fail recipes, and everyday culinary know-how from the program in How to Eat Supper, a kitchen companion unlike any other. This is no mere cookbook. Like the show, this book goes far beyond the recipe, introducing the people and stories that are shaping America’s changing sense of food. We don’ t eat, shop, or cook as we used to. Our relationship with food has intensified, become more controversial, richer, more pleasurable, and sometimes more puzzling. How to Eat Supper gives voice to rarely heard perspectives on food—from the quirky to the political, from the grassroots to the scholarly, from the highbrow to the humble—and shows the essential role breaking bread together plays in our world. How to Eat Supper takes you through a plethora of inviting recipes simple enough to ensure success even if you’ve never cooked before. And if you are experienced in the kitchen, you’ ll find challenging new concepts and dishes to spark your imagination. LYNNE ROSSETTO KASPER, host and cocreator of The Splendid Table radio program, has explored food for more than forty years as a teacher, researcher, writer, and lecturer. 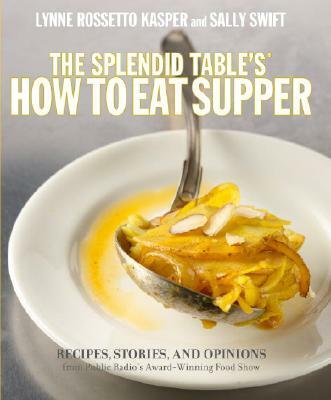 Author of The Splendid Table, winner of both the James Bead and Julia Child/IACP Cookbook of the Year awards, she also wrote The Italian Country Table and coauthored The Splendid Table's How to Eat Supper with Sally Swift. Lynne is a member of Who's Who of Food and Beverage in America and a longtime advocate of organic and sustainable foods. She and Sally have worked together for nearly twenty years and still get a kick out of each other. SALLY SWIFT is the managing producer and cocreator of The Splendid Table radio program and coauthor of The Splendid Table's How to Eat Supper. She is an avid gardener, bicyclist, and public radio aficionado. After nearly two decades of working with Lynne, her only complaint is that they rarely have time for a real lunch.